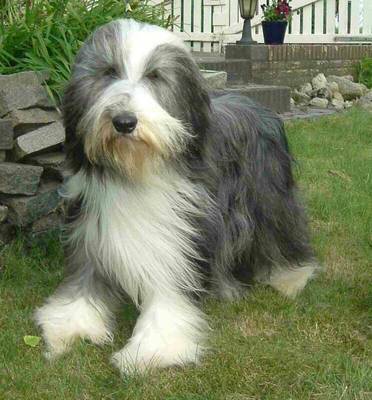 Average Height	: 20" - 22"
The Bearded Collie originated in Britain and is one of the country's oldest breeds. The foundation of the breed was started in 1514 when a Polish sea captain made a trade with a local Scottish shepherd. He traded three of his Polish Sheepdog (Polski Owczarek Nizinny; PON) for a ram and a ewe. The shepherd then bred these dogs with other herding and flock dogs such as the Old English Sheepdogs (bobtails) and the Komondor. The dogs were used as herding dogs for centuries in Scotland and became known as the "Highland Collie," the "Highland Sheepdog" and the "Hairy Moved Collie." They were excellent workers, herding sheep and cattle for local shepherds. The name "Bearded" comes from the long hairs that grow on the chin, making the dog look like he has a beard, and the name "Collie," which is the Scottish word for herding dog. The Bearded Collie almost became extinct during the Second World War. It was developed as an independent worker, capable of thinking on its own and making decisions about the safety of their flocks without depending on the shepherd who might be miles away. Beardies have never brought home a wrong sheep despite the practice of flocks intermingling while out to pasture. The Beardie is still used as a shepherd's helpmate in Scotland, and in the U.S. The breed almost disappeared in the early part of the twentieth century, but was rescued through mating a pair in 1944 when Mrs. G. O. Willison from Great Britain bred a pair of Bearded Collies, resurrecting the breed. They are still to this day considered a rare breed. Some of the Beardie's talents are tracking, herding, agility, competitive obedience and performing tricks. The breed almost disappeared in the early part of the twentieth century, but was rescued through mating a pair in 1944. Even today, it isn't very widespread and it's still fairly rare in the United States. The first US litter of Beardies was whelped in 1967. G.O. Willison brought the breed to recognition by The Kennel Club of Great Britain in 1959. They have a dense, weatherproof outer coat with a thick, soft undercoat. He's really terrific with kids and thrives, but NEEDS to be with people. He needs to be a part of the family unit and would wither without human contact. If he is left alone without human contact and has nothing to do, he will get into trouble. He certainly can be trained to do just about anything, but not to be a watch dog. They are noisy barkers yes, but not watch dogs. Their forte is herding animals - and their people (with a grin!) You don't need a doorbell when living with a Bouncie Beardie. Beardies jump and can even clear very high fences, if they don't have something to do that appeals to them. They'll also jump up to greet you, kiss your nose and look you straight in the eye. Great trick, but it can scare little ones and others who aren't used to such enthusiastic greetings. The Beardie may have gotten one of its other names - bouncing beardie - because when working in thick undergrowth on a hill, they bounce to catch sight of their sheep. It's also speculated this name came from the way they face a stubborn ewe, barking and bouncing on the forelegs. The bearded moves stock using body, bark and bounce. Very few beardies show "eye" when working, most are usually upright. Progressive Retinal Atrophy - manifests as night blindness, slowly progresses to total blindness. Beardies need lots of grooming. And if you take one look at their coats, you will know why. Either you will have to learn to groom like a pro, have them groomed by a pro or clip all that shaggy hair. Groom thoroughly at least once a week, more often during your puppy's shed. Lay your dog on its side then mist with some anti-tangle spray. What follows next is something called line brushing. Brush hair up with a bristle or pin brush, then brush hair back down a few inches at a time. If you encounter mats, work them out with the spray and your fingers, or use a mat rake. When you are done, you should be able to get a comb through his coat quite easily. Make certain to check for ticks during tick season and pay attention to the length of the toenails. If they run on hard surfaces a lot, they will wear their own nails down. But if not, then you will either have to clip them yourself, or have a professional do it for you. Bouncie Beardies need LOTS of exercise! And this does not mean just running around the backyard. They need vigorous exercise every day, and at a minimum should get an hour of rigorous (romping) exercise at least three or four times a week. Beardies have no end to their energy both indoors and out. If left to their own devices, they will make up their own games to play and chew on whatever they can find - if not jump fence and take off. Outside they will entertain themselves by digging holes. The goal is to stimulate both the mind and the body of your Beardie - engage his limitless curiosity and high intelligence. An ideal workout for your Beardie if you don't run sheep or other livestock, would be a rousing game of fetch with balls or a Frisbee, throw in some swimming, running along side you while you bike and hiking. Whatever it is you choose to do physically, just include your Beardie. They're happiest when doing things with you and are up for anything from wrestling to swimming. The best exercise regimen for your Beardie would be at least two 45 minute walks a day, no matter what the weather may be. While you may not be too happy with the weather, your dog doesn't mind in the least. This may vary depending on your dog, as each one does have its own personality. While on your walks try to have about 30 minutes full tilt running off leash and include a game of fetch or even a tug of war. You need to also include at least 20 minutes of obedience training, trick training or other activities that keep your dog's mind sharp. If he's mentally stimulated he's happy. If he's happy, he's well-behaved. If you don't think what you are doing is enough for your dog, don't increase the physical part of your routine, increase the educational portion instead. That would mean more obedience training, tricks - things to keep his mind busy - to stretch his mental limits. Working his mind will make him more tired than working his body - remember, their stamina is phenomenal. And they ALWAYS have energy to spare, even if you don't! The Bearded Collie is very intelligent and quick to learn. However, he is an independent thinker and can be very stubborn. Obedience training must be fun, consistent and fair. It should also start at a young age and continue into adulthood. These dogs can be master manipulators, and are very adept at getting their own way. The hardest thing about owning a Beardie is not teaching him the wrong things. If you don't stay mentally one step ahead of your Beardie, your Beardie will do a very good job of training you. Your youngster is like a 2 year old child pushing his luck to see what he can get away with. If you do let him get his way, you will eventually end up with about 50 lbs of dog who 'won't walk on a leash' or 'doesn't like to be brushed' because when he was younger he found out that throwing a tantrum got him out of doing anything you wanted him to do. This behavior often can reappear around the teenage stage when they start feeling full of themselves and test to see who's in charge.